The Canadian crooner is in the UK capital as part of his To Be Loved worldwide tour and has sold out all ten shows. 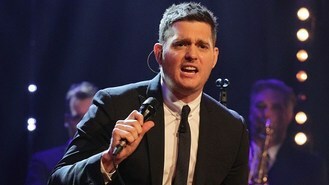 Michael declared: "To be able to sell out 10 nights is just stupid," as he dedicated his self-penned track Home to the UK audience. The singer worked the crowd, high-fiving the guys and blowing kisses to his adoring female fans, performing American song book classics and covers including Daft Punk's Get Lucky and The Beatles' All You Need Is Love. Originally due to perform six shows at the O2, Michael added four extra dates after the first run sold out in just five minutes. Meanwhile, for those who weren't lucky enough to get hold of a ticket, documentary film Michael Buble's Day Off appeared on ITV at the same time. Michael gave fans a glimpse of his life off stage as he took a day off in his hometown of Vancouver, visiting family and friends before attending his 20th high school reunion, unannounced. Michael was seen having coffee at McDonalds with his grandfather and his friends, having lunch with his sisters and taking a trip on his father's boat, before catching up with his best friend to reminisce about his school days as they headed to the reunion.